this post is sponsored by CocoVi. Last week I was all about homemade cosmetics and self-care, but this week we’re talking about food! 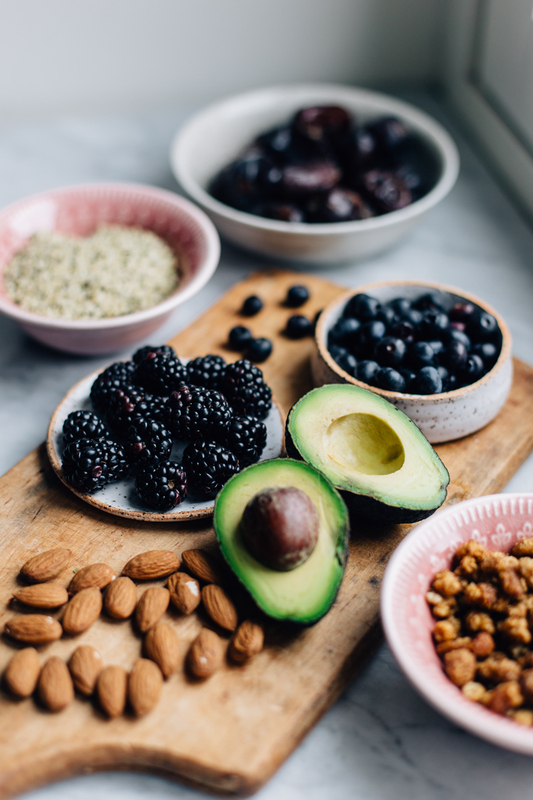 This is my second post in collaboration with CocoVi and for this post I decided to talk about my favorite pregnancy superfoods, meaning the foods that I’ve been enjoying and loved throughout my pregnancy (even during the awful nausea). Pregnancy has brought a lot of changes both mentally and physically for me, and it has naturally affected on what I eat – and also to what I haven’t been eating. It took a lot of mental flexibility in the beginning when I found myself craving for more meat, mashed potatoes, pizza, fish fingers, and all that comfort food instead of colorful veggie dishes and my dear lentil stews. So it took some effort to be okay with the fact that I was actually craving for the foods I hadn’t eaten in years, or a decade, and things I kind of thought were off-limits. But in a way it’s been a good practice to get out of my usual patterns and have a more relaxed attitude towards food, and life in general. One of my go-to smoothies with pear, frozen mango, frozen wild blueberries, psyllium husk powder, dried nettle and plant milk. I sometimes add some frozen spinach too, and if I want to make this a bit more filling, I’ll add some hemp seeds, hemp protein or soaked cashwes. There’s an endless amount of guides and rules on what to eat and what not to eat while pregnant, and the challenging part has been to just trust myself and eat what I feel like my body is needing at the moment (but naturally I’ve given up on the things that should be definitely avoided). But for example I’ve been eating more animal products and meat than before, as even the thought of lentils and beans made me sick for a long time and my stomach wasn’t able to handle them at all. But besides the comfort food, I’ve luckily been in the mood for a lot of smoothies, different porridges, fruits, banana pancakes, and all sorts of veggie-filled wraps. 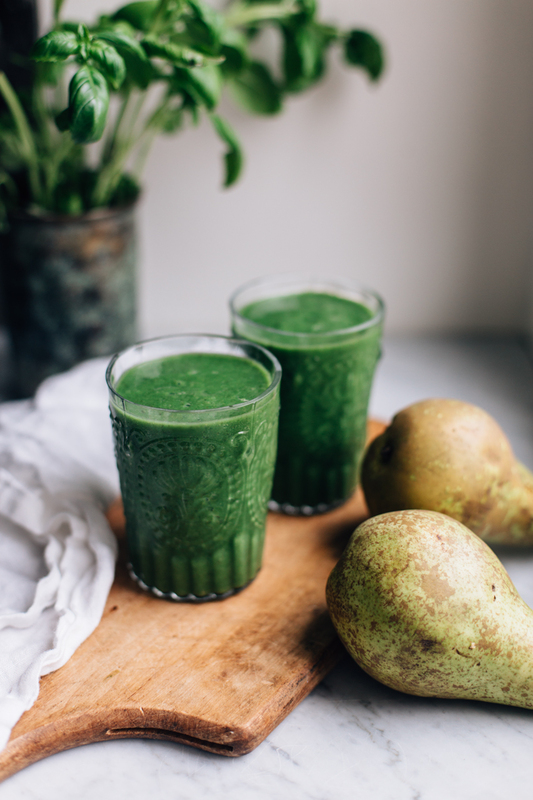 A simple green smoothie with banana, pear, frozen spinach, dried nettle, and plant milk. Spinach: I use spinach almost daily and I love to add baby spinach to my salads or other foods. I also use a lot of frozen spinach and add it to my smoothies. Frozen spinach has been a super easy way to add some greens to my diet especially on the days when I don’t feel like eating anything green. And besides making green smoothies out of it, I add a few pieces to my berry smoothies as well since spinach has a very mild taste. Nettle: I’m a true fan of nettle and have talked about it here on the blog before as well, since it’s such a great ingredient. 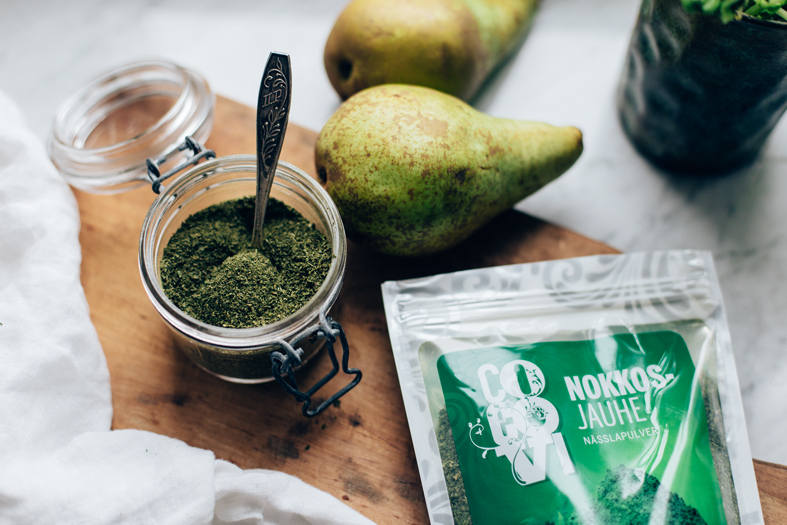 It’s nice to pick up some fresh nettles in late spring and summer, but usually I go for the dried nettle powder, as it’s super easy to add a teaspoon of it to smoothies, soups, stews, or on top of an omelette. I always thank nettle for my pretty good immunity and for the fact that my hair grows out very quickly, but now while being pregnant, I’ve also been taking it for the plant-based iron it has. Fruits: I’ve always been eating a lot of fruits but pregnancy has been making me eat even more, and I can easily eat up to 5 fruits a day! In the beginning I ate a lot of citrus fruits as they relieved some of the nausea I had (besides eating the fruit, I sometimes just cut a lemon or mandarin in half and inhaled the scent of it as it eased the nausea as well), but I love bananas and pears too. I use bananas in baking a lot as well, since they bring a nice natural sweetness and make baked goods moist, which I love. Wild berries: The great thing about living here in Finland is that we have a lot of wild berries, which are full of vitamins and other good-for-you things. I eat berries daily and add them to smoothies, on top of porridge, or on top of pancakes. I’ve been craving especially strawberries (probably because of the vitamin C), but have been eating all sorts of berries (mainly frozen, as we don’t have fresh berries this time of the year) through the entire winter. Especially in the beginning when I didn’t have much of an appetite for real food, I used to make smoothies, porridge, or sandwiches for dinner and adding berries to my meals was an easy way to get some good nutrients. 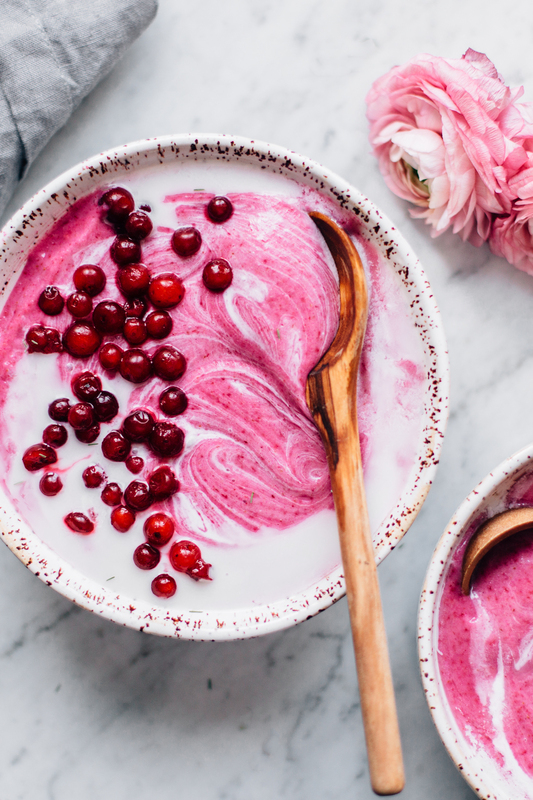 Whipped Lingonberry & Millet Porridge. I love adding nuts, dried mulberries and hemp seeds on top of my morning porridge or smooothie. I’m a huge berry lover too. 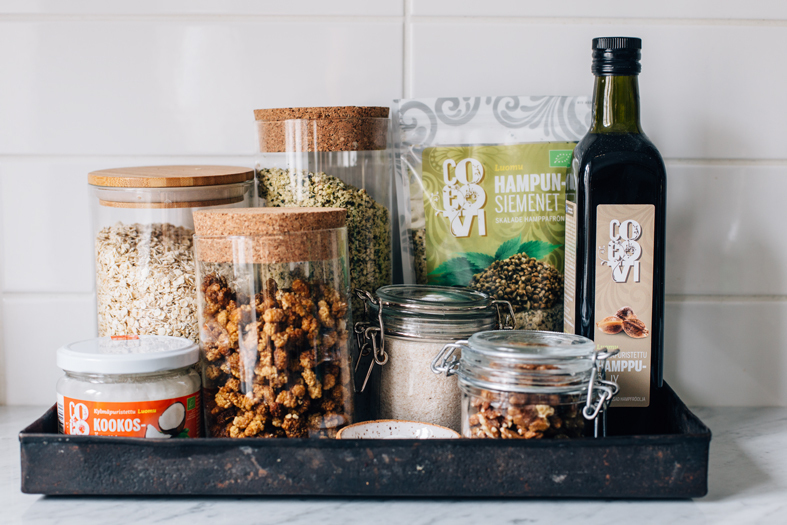 I always have some rolled oats, dried mulberries, hemp seeds, psyllium husk powder, nuts, and good oils at home. 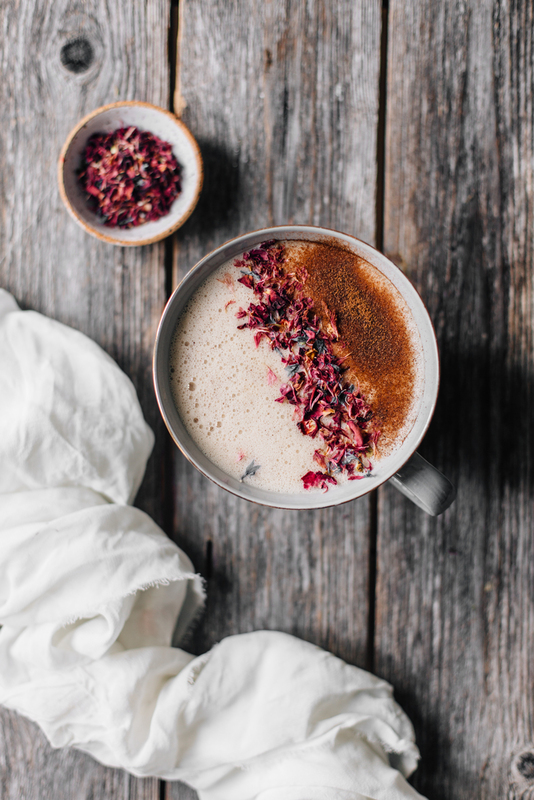 A creamy rooibos latte made with rooibos tea, oat milk, coconut butter (or coconut oil) and a fresh date. Coconut oil: Besides being great for skincare, coconut oil is a staple in my kitchen. I use it for frying, as it can handle high temperatures well, it’s great for baking to replace butter, and it’s easy to add a spoonful to hot drinks, smoothies, or in porridge to bring some extra energy and creaminess. My friend had a habit of adding a spoonful to her morning smoothie while being pregnant, and I’ve sometimes added a spoonful to my morning porridge to relieve any constipation. 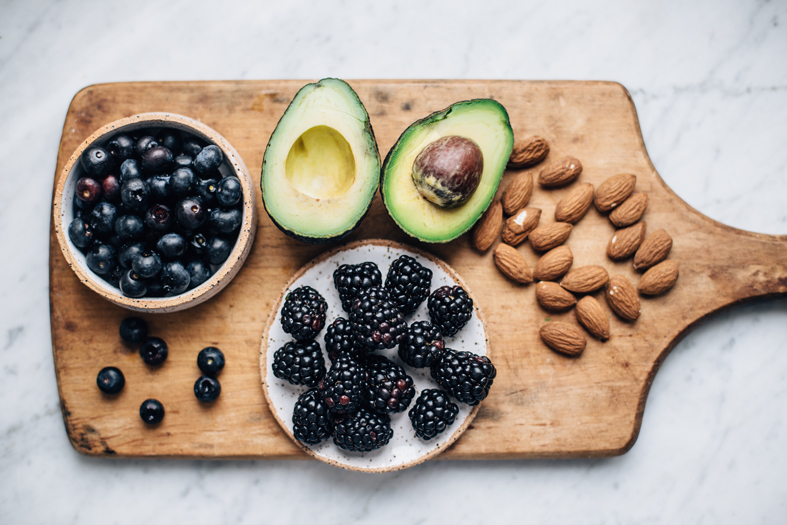 Healthy fats: I still remember the time I was avoiding fats and oils as much as I could and everything had to be fat-free, whereas now I make sure to have enough healthy fats daily. Besides being good for you, I’ve noticed that healthy fats nourish my dry skin that is prone to eczema. Avocados are an easy way to have some good quality fats, but I also like to use avocado oil (it’s great for frying too), olive oil, and hemp seed oil from CocoVi. I’ve been using hemp seed oil especially during winters when my eczema has been pretty bad, and I’ve been having a spoonful of hemp seed oil either in salads, on top of soup, or in my morning porridge. Hemp seeds: Seeds are not recommended while pregnant here in Finland due to any heavy metals in them, and I haven’t been eating a lot seeds after getting pregnant just to be sure. Hemp seeds have been a favorite of mine for years already and they’re pretty much the only seed I’ve been eating every now and then throughout my pregnancy. Hemp seeds have been an easy source of some added protein and healthy fats especially when my appetite has been lacking. Besides hemp, I’ve eaten chia puddings every now and then as well if I’ve been in the mood for it. There’s usually seeds in many gluten-free products as well, so I haven’t been stressing about it that much as I’ve felt that seeds are not probably the worst thing you can eat while pregnant. And when I’ve been using seeds, I’ve chosen organic ones (CocoVi’s seeds are organic, which I think is great). Dried mulberries: Dried mulberries are another favorite way of mine to add some sweetness to my day, and I love to add them into my morning porridge (I cook them with the oats so that they’ll become super soft and chewy), or I add them on top smoothies, pancakes, yogurt, or just eat them as they are if I’m in a need of something sweet. 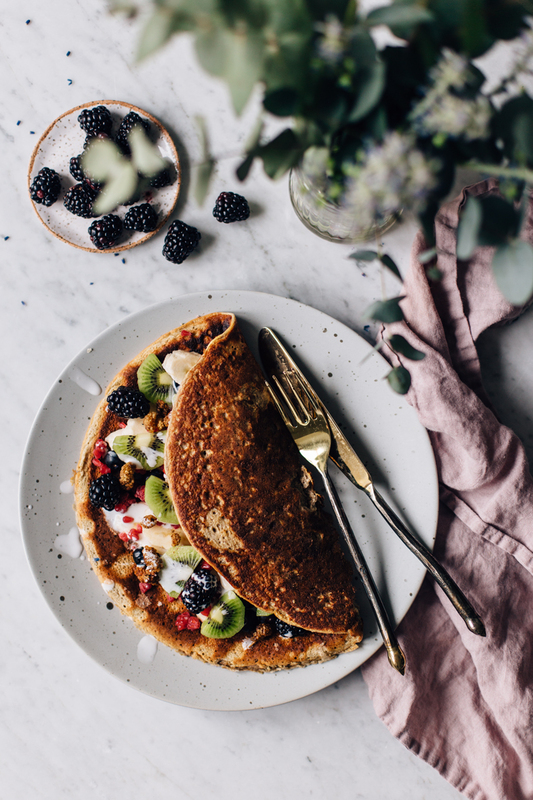 My go-to breakfast especially in the first trimester: a huge breakfast pancake with berries and fruits. A vegan chocolate milkshake with frozen banana, cashews, date, raw cacao powder (or dark unsweetened cacao powder), ice, and almond milk. 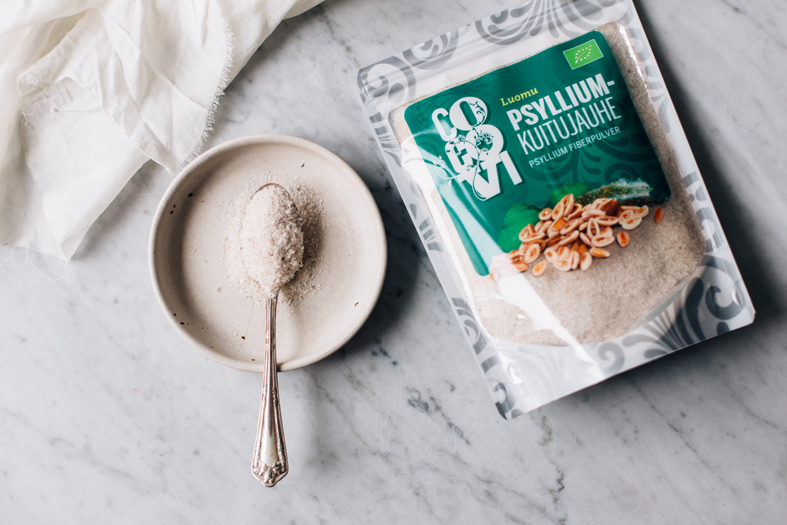 Psyllium husk powder: Besides being a celiac, I also have a very sensitive stomach and all the pregnancy hormones have brought it’s own add to the mix (not gonna share too much). I’ve been using psyllium husk powder usually just for baking and taken it with me while traveling in case I need some extra fiber, but now I’ve been adding it to my smoothies and pancakes as well. That added fiber has been easing out my stomach issues, and psyllium husk is said to help both diarrhea and constipation, so it’s great for all the pregnancy-related stomach problems. Psyllium husk also makes smoothies really creamy, so it’s a great add if you’re in the mood for a spoonable smoothie treat. 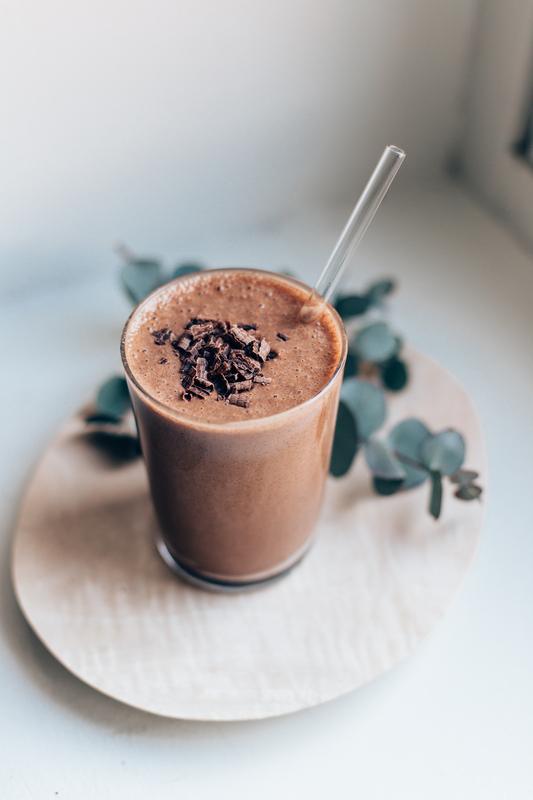 Hemp protein: I don’t use a lot of protein powders since most of them are not a great fit for my stomach, but I’ve been using hemp protein ever since I was diagnosed with celiac’s disease, as a nutritionist suggested it for me. And now while being pregnant, I’ve been adding a spoonful of organic hemp protein powder to my smoothies, and it’s been an easy way to get some protein while I’ve been mostly in the mood for carbohydrates (I blame winter for this as well). Nuts: While reducing the amount of seeds I eat, I’ve been using more nuts lately as they’re an easy source of some added energy and good fats. 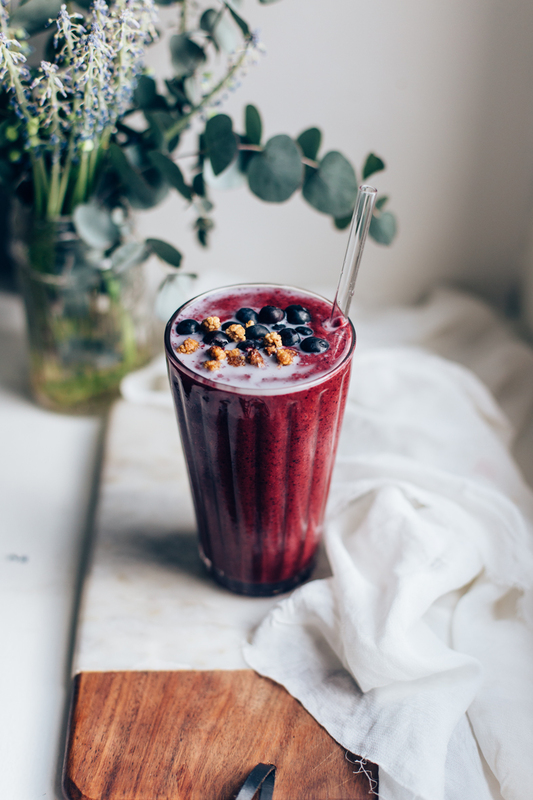 I like to add soaked cashews to my smoothies to make them creamy (like in this smoothie), walnuts are great on top of porridge, and I think almonds are best when roasted in the oven for granola. Brazil nuts are a favorite too, and I like to add a couple soaked ones to smoothies too. Phew! That was a long list of food! Thanks for making it here till the end. Before jumping off to a recipe (I thought you deserved that after all this reading! ), I just want to say that every pregnancy is a very unique experience, we’re all different, and the most important thing is to do as you feel is right. I’m not a doctor or a nutritionist, and these were just some of my own experiences, but hopefully they’re useful to some of you out here. Besides growing a new life, pregnancy is definitely a journey into yourself, as at least for me a lot of the things I was used to liking went out of the window. It’s also been relieving to acknowledge that there is no such thing as a perfect pregnancy, and there are so many things that are out of our hands and you just need trust your body to do the work and try to keep up with all the changes happening :) And instead of going forward full-steam on, this has definitely been the time take it easier and just enjoy the ride. But now, I thought I’d share the recipe for my Power Breakfast Pancake, as it’s been a life savior on many mornings, and afternoons too. I hope you enjoy it as much as I do! notes: if I make this for breakfast, I usually use two eggs, but if I’m making it as an afternoon snack, I’ll reduce the amount of eggs to one. you can use other gluten-free flakes or flour in these too and usually make this with the ingredients I have at hand. I love to eat my pancake with lotsof toppings and pretty much always add some coconut cream or plant yogurt on top too. 1. Break the eggs into a blender. Add all the remaining ingredients and blend until smooth. Let the batter rest for a couple of minutes. 2. Heat a frying pan and add a bit of coconut oil to the pan. Pour the dough to the pan and fry on medium heat for a few minutes until the surface begins to dry up. Turn, and continue to fry for a short moment. 3. 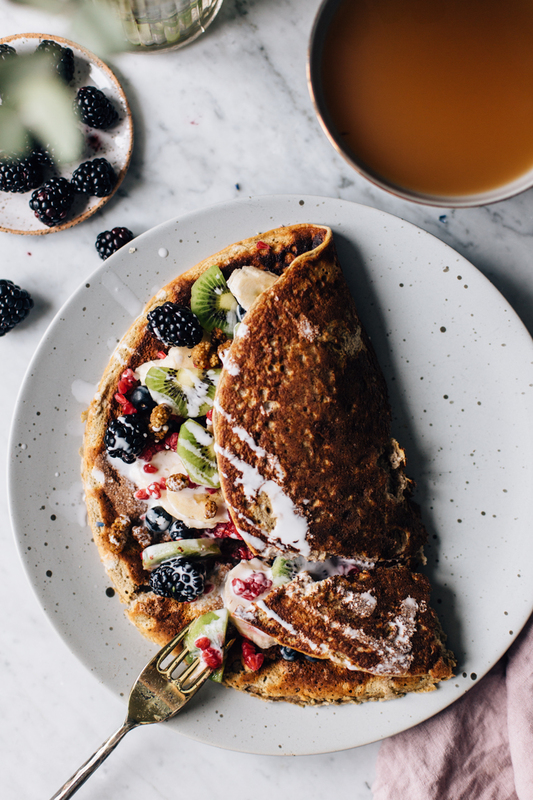 Serve the pancake warm with berries, fruits, dried mulberries, and coconut cream and enjoy! Tagged berries, breakfast, health tips, pancakes, pregnancy, wellbeing. This Homemade Body Butter is made of just few ingredients: coconut oil, cacao butter & almond oil! It's great for the entire body and for preventing stretch marks as well. No eggs, oil, or weird ingredients needed – these gluten-free and vegan no knead bread rolls are super simple to make and the flavor and texture are close to perfect!